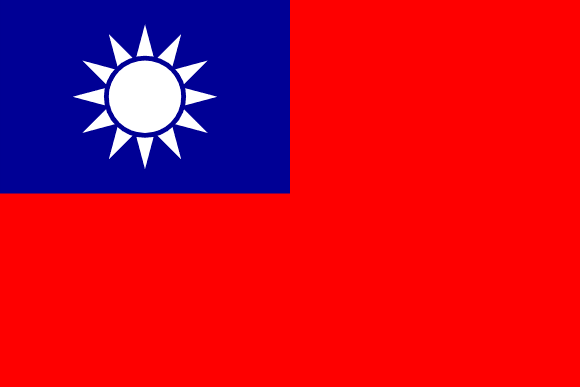 The flag of Taiwan consists of a red leaf bearing a small blue rectangle in the upper left part of the flag. In the middle of the rectangle, a sun with twelve rays is located. The flag has been adopted in 1949 when the Chinese communists defeated the Kuomintang, which subsequently established an exile government in Taiwan. The red is a traditional Chinese color and the sun rays represent twelve hours of day and night, thus indirectly symbolize the progress of the country. The sun itself stands for yang principles and the colors together denote three basic principles of humanity - patriotism, democracy and chastity. The Taiwanese flag is very similar to the former flag of Burma.